These minute taking courses are for people who need to take accurate and factual meeting minutes. This course will benefit both you and your organisation by learning how to capture the critical detail from meetings, and disseminating clear action points to the right people. Have no improvements to suggest, Andrew was brilliant! I thoroughly enjoyed this course. As explained I have been taking minutes for sometime, however, this course highlighted aspects that are very important in minute taking. Particularly enjoyed the chapter on critical thinking and the exercise when we had to summarise the paragraph on the powerpoint presentation. The course was very well run and the small group made discussions very easy. Quick to build a rapport which greatly helped in a workshop environment. Below are some extracts from our Taking Minutes manual. 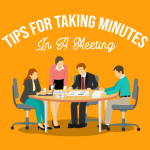 The minute taker plays a vital role within the meetingstructure. The minute taker has legitimate, easy access to other members of themeeting, including those in key positions. The minute-taker has many names: recording secretary,secretary, note taker, recorder. In many meetings, the chair may act asrecorder, but this is not recommended because it prevents the chair fromdevoting his/her full attention to the discussion and may result in incompleteminutes. To function properly as a minute taker, you must also bealert, highly organised, and focused on the group discussion, to restate thepositions and the discussions of others accurately and objectively. Noteveryone is suited to this job. A minute taker must be a good listener, asound critical thinker and an excellent organiser. The ability to really listen is an important skill foranyone to have. Listening allows you to understand where the other person iscoming from and shows you’re interested in what he/she is saying. Unfortunately, we all experience common listening problems. To take accurate minutes, you must be able to thinkcritically and quickly. Minutes should be a record of the facts of the meeting,they must not be tainted by biases or judgements. Imagine a computer that gives or records the facts and figuresfor which it is asked. The computer is neutral and objective, it does not offerinterpretations or opinions. When writing minutes, the thinker imitates acomputer. The person requesting the information should use focusingquestions to obtain information or information gaps. This type of thinkingprovides discipline and direction. The thinker strives to be more neutral andmore objective in the presentation of information. There are many ways to organise your minute notes. Whatevermethod you choose, it must work for you, and it must be consistent and help youcreate accurate notes. One method is to develop a template beforehand, depending onthe style of the meeting and the minutes you will be preparing. Minutes are a permanent, formal record of what went on in ameeting. When approved, minutes are considered legal documents and can be usedin legal proceedings. Minutes may be written in a variety of styles, includingformal, informal, or action. The choice of style is based on the nature of themeetings and the bylaws of the members themselves. Formal minutes support a meeting which is governed by achair according to a parliamentary code or procedure. There are many referenceguides to parliamentary procedure, such as Robert’s Rules of Order orProcedures for Meetings and Organisations. Informal or action minutes are used by small groups who donot have a clearly defined operating structure. Minutes don’t have to be verbatim to be proper, except for motions,which should be recorded word for word. Word for word documents are tootime-consuming to prepare and to read. However, groups differ as to how muchdetail they require. Some groups want minutes to be an outline of everythingthat was discussed so they have justification for decisions. Others feel thatbackground information is not essential, providing members understand theremarks. It is important that you, as minute taker, know what type of minutesthe group expects to receive and can deliver them consistently. Small groups, perhaps because of their size, sometimesprefer to operate more informally. However, minutes are still a vital componentof the meetings. They report what occurred at the meeting for the people whowere absent, and for future reference. They summarise the action taken, theaction planned, the people responsible, and the deadlines. Informal minutes are written in a narrative format, incomplete sentences. They include some background information, keeping in mindthey are written solely for the benefit of people already familiar with thegroup and its activities. Action minutes are best suited for meetings that operate ina purely conversational manner. They can be written in point form. You need toidentify the person or people responsible for future actions and set timelimits. In many informal meetings the minute taker is encouraged toparticipate in discussions, or the chair may also act as minute taker. In somegroups, members share the responsibility of minute taker with a differentperson appointed for this task at each meeting. In such situations, actionminutes are usually easiest to use. They allow you to make notes as well asparticipate, and the straightforward format keeps the minutes consistentdespite the different people involved. The traditional style of meetings discussed so far is notparticularly suited to informal problem solving, collaboration, or for workingout complex, interdependent issues. Often, progressive organisations will cutmeeting times of this nature with interactive meetings. In conventional meetings, the chair normally has the mostauthority. The chair controls how the meeting proceeds, talks more than anyoneelse, and is responsible for the final decisions. This can affect groupparticipation and morale and can result in poor decision making. In the interaction style meeting, the chair separatesprocedural and decision-making responsibilities and appoints someone to handlea new role: that of the facilitator. This enables the chair to sit and listenfully to the opinions of the group. The facilitator’s job is to accomplish a specific set oftasks. The facilitator must solicit opinions from the entire group, ensure thateveryone feels comfortable with the process, and keep the meeting on target. The facilitator is assisted by the recorder, who ensuresthat all the members’ main points are written on large sheets of paper taped tothe wall in front of the group. In this way, everyone has a clear and immediateunderstanding of what is being said and can see that all statements areaccurate. All ideas are considered to come collectively from the group, notfrom individuals, so the names of the originators of suggestions are notrecorded. Both the facilitator and the recorder must remain neutraland refrain from voicing their opinions. If either one feels the need to make apersonal statement, he or she must ask the group’s permission to temporarily stepout of the assigned role. Interactive meetings are highly creative and productive.Members feel less intimidated and have equal opportunity to participate inbrainstorming and problem-solving sessions. They leave feeling heard,validated, and energised. If you are appointed recorder at an interaction meeting,remember that your role is always to support the facilitator and the group. It is important that you, as recorder, not put words in themouth of a slow-thinking participant. Talk as little as possible and defer yourquestions to the facilitator. When listing the group’s comments, make the letters about 1inch to 1½ inches high. Don’t worry about your spelling. You can useabbreviations, circle key words, or use arrows and signs. Use coloured markersto highlight ideas. Remember to number and title all pages. Get the members torestate any points you have missed or misrepresented. The meeting members sharethe responsibility for accurate recording. After the meeting, remove the pages from the wall, label andstore them, or have them typed. The recorder is also responsible for preparinga summary sheet or action minutes.